Skyscript.co.uk :: View topic - House Systems --which do I use and why? House Systems --which do I use and why? Posted: Thu Nov 24, 2016 8:30 pm Post subject: House Systems --which do I use and why? Firstly, I have scanned the articles and forums, and can't find anything that discusses the merits of various House Systems. If there are any postings regarding this, please direct me there...I started out years ago using Koch, mainly because that was what my first teacher used, but there was never any real discussion with her about the "why." Later I started using Placidus, more as a curiosity to see what differences there were. For the last couple of years, I have began to have growing discomfort with both...things just seem a bit off. I tried using the Ascendant as a reference point...did the subject look like/act like the Ascendant when it was different from one system to another...and got even more confused and discouraged. Are Equal Houses the same as Natural Houses? Should I be using that? Any input would be welcome. "Consider everything, but never cry." "I often give myself very good advice, but I seldom take it." the search feature on the left side of this page is useful.. it will turn up all sorts of topics, or links with discussions of house systems.. here are a few below. nothing is all that black and white, but essentially one either treats a house like a box with goodies in i(or not), or they view the angles as the primary basis for the division of the circle. these angles can be viewed as more like a vibration or something like crest of wave. obviously there are different ways to view it all, so i leave it to your imagination to ponder all the possibilities.. if you are looking for hard fact, there is very little to none of it in astrology. Welcome to Skyscript. Good to see such enthusiasm for astrology! I asked members here back in 2013 their preferred house system to display charts in a poll. I think there was quite a high response rate to my poll. The most popular reply was Whole Sign Houses. A system you haven't included in your list. Another prominent reply apart from Placidus was Regiomontanus which is very popular for horary. Of course Skyscript is focused on traditional astrology and techniques so what is popular here is not necessarily a cross section of the whole astrological community. i thought tamirenee might have meant whole houses by saying natural houses.. i wasn't sure what natural houses were! are those the houses up on the hill behind my place? Mark, big thanks to you too! You wrote several very informative posts in that thread and linked to some others...I have my reading assignment for the next two weeks! As I said earlier, I have huge gaps in my knowledge...My "learning" program is an 8 year old version of TimePassages, which I supplement with a full shelf of Sakoian & Acker. I haven't had good access to classes etc, so I have been in a vacuum, muddling along with trial and error, so I was very excited to find this forum...there is a lot of BS out there. Thanks again for your patience with an enthusiastic but poorly established newb. I don't know what natural houses are either - though James's answer really gave me a good chuckle. I don't know if anyone can provide you with an answer to what houses you should use or why, which isn't to say that people will not try. I think the one thing that's apparent in the astrological community is that there's a subset of people for whom there really is only one 'true' house system and the others are just pale imitations. Then there are those who just sort of think you should try one and if it works for you go with it. And still others who believe that perhaps all the house systems work but reveal different things or are to be used for different things. Maybe it's good though to run through what the houses are and why we may use them in the first place and what astronomical problems each house system solves - this may seem a bit redundant but I actually think it's quite useful to understand the houses in this way. A couple of things to begin with though is to recognise that the ascendant is a separate concern from the house systems. In every single house system the ascendant will be the same. The ascendant is an astronomical point, and most house systems are calculated at least in part from this astronomical point. It is the place to the east at which the ecliptic (the circle/band along which all the planets move) intersects with the horizon. Though the course of a day, the earth will make a full spin on its axis, and this means that, from our vantage point on earth, it looks like we're stationary and the entire sky is spinning around us. The Sun, Moon and planets (and indeed stars) look like they rise somewhere in the east and through the course of a full day they make their way up over the horizon, and then set somewhere in the west and we can imagine them going from west back to east under the earth only to rise again in the east the next day. This motion is called 'primary motion'. So in the course of a day all the planets will move from the east to the west and back to the east in a full circle. The house systems then are a way of plotting where, at a given time of the day (like for example the moment of birth) the planets happen to be in the sky keeping in mind that they move along this motion. But the ascendant itself will be the same irrespective of which house you use. If you want I can run through all the major house systems and explain the philosophy behind each one and what sort of astronomical or philosophical problems each one tries to solve, because there are many ways we could think of of dividing up the sky so as to plot which house a given planet is in - all the house systems are examples of each of these different ways. I'll mention briefly here (or at least as briefly as I can) what the problems, as I understand them, are that each house system attempts to resolve or the ethos behind how each house system tries to do what it does and why. Some of this may seem obvious or you likely already know but bear with it. I mentioned before about primary motion and how the planets move through the entire sky in the course of a day as they're carried from the east at the ascendant and move in an arc over the horizon until they set in the west at the descendant and then come back under the earth to the east again the next day. The house systems then are a way of plotting where, at a given time of the day (like for example the moment of birth) the planets happen to be in the sky keeping in mind that they move along this motion. The house systems attempt to define therefore where in the sky a given planet is, and divide the sky in such a way that they are said to fall in one of the 12 houses. Every single house system does that differently but every single house system has a sound astronomical reason for doing it, and often do so because they solve some astronomical or philosophical problem. We describe the houses according to three categories - they can be angular, succedent or cadent. Angular houses (1,4,7,10) have a sense of dynamism, action and being charged with power to act. They have been described as being pivots or even like supports which hold up the sky itself. Either way they have a sense of power attributed to them. Succedent houses are so called because as the earth spins it appears that planets in a succedent house are 'succeeding' toward being angular - it is as though the planets go from a sense of being less dynamic or less capable to finally succeeding in attaining this dynamism when angular. So succedent houses (2, 5, 7, 11) are those which are coming next, and are so called because they are succeeding toward the angles. Cadent houses then connote a sense of falling away from the angle. So they fall away and are stripped of the power and dynamism they had when angular. So succedent houses are like a moving toward power, angular houses being an attainment of that power, and then cadent houses being a stripping away of that power. This motion of the planets through the houses in relation to the four angles is very important and from our first systematic dealing of the houses in Manilius we see that this motion is kept in mind. We'll return to it later. In addition, the houses connote topics of meaning or signification, which are well known, such as the first house being of the appearance/body and the second of finances, third is siblings and so on. I'll just include a list of technical terms here and then in my next posts describe the house systems as I see/understand them. If you forget later, just return to this list but I think it will be easier and you'll benefit from it more, if you don't already know what these terms mean, to just try to visualise them and understand what they mean - they're typically just words to describe our orientation or position on the earth or sky or describe geometrical features of the earth or sky and how to define positions on them. Celestial Sphere - The apparent sphere surrounding the earth which appears to turn with primary motion, with the earth imagined as right in the middle inside that sphere. At any time, only half the celestial sphere is visible to us. As we stand outside and look up into the sky, we can imagine any planet/star/great circle etc. can be projected outward onto the 'surface' of the celestial sphere, which has an arbitrary radius. Celestial Equator - The great circle perpendicular to the earth's poles, equidistant from both, dividing the earth into two hemispheres, ie, the earth's equator projected out into space (I will refer to the equator generally to mean either). So just think of the equator, but this time imagine it projected out indefinitely into space onto the celestial sphere perhaps. Ecliptic - The apparent great circle inscribed by the sun as it appears to move around the earth in a given year, upon which all the other planets also travel. It is important to keep in mind the ecliptic is angled in relation to the equator by 23.4� (they are not parallel). At any time, only half the ecliptic is above the earth (ie, above the horizon). Meridian - The imaginary line/arc inscribed between the poles, passing through the zenith of an observer. It therefore is a line which runs north-south though the point overhead - imagine you stand facing north and draw a big arc from north straight up over your head and back down south - that's the meridian line. Midheaven - The intersection of the meridian with the ecliptic to the south (in the northern hemisphere, north in the southern hemisphere), therefore the most southerly point on the ecliptic (the IC is the point opposite). In otherwords it's the part of the ecliptic directly south for all northern observers. Diurnal Arc - The path it takes for a point (for example a planet or star) on the ecliptic to rise over the horizon in the east at the ecliptic (therefore at the ascendant) to set on horizon in the west (therefore at the descendant). Nocturnal arc is the opposite - from descendant to ascendant. The diurnal/nocturnal arc follows the motion of the turning of the earth, therefore are perpindicular to the poles, therefore are parallel to the equator. altitude - how 'high up' a planet is in relation to the horizon. If you pointed a finger out at the horizon and then moved it up to some star you see in the sky, that angle is the altitude. azimuth - if altitude is a 'y axis' then azimuth is the 'x axis', the 'left-right' coordinate along the horizon. With these terms in mind, I can describe what all the house systems do briefly and why. The goal is to find a system that will divide the sky into 12 so as to plot which house a given planet/star/etc is in. Whole recognises that we already have a 12 fold division of the sky - the ecliptic is divided into 12 already, it's called the zodiac. Therefore whole says find whatever zodiac sign is rising, and suggests the beginning of that zodiac sign marks the beginning of the first house. All other houses are found from the beginning of each subsequent sign. It's simple and easy to calculate. It assumes that the ascendant is the prime position and from that ascendant everything else emerges. It's worth noting that many traditionally leaning astrologers have begun in recent decades to take up whole sign houses. This is likely because of a claim made that whole sign houses are the original house system. Whilst this statement has attracted some degree of criticism or that it's oversimplifying the history of houses it remains nevertheless an attractive house system to many perhaps in part because of this claim and it is certainly the case that some of the big lights in astrology promote the use of whole sign houses. However it does suffer from some difficulties. Imagine the distinction we make between whole sign aspects and aspects by degree and we might understand some of them. Let's imagine that 28� of a sign is at the ascendant. It means that the majority of the first house is above the horizon and it becomes unclear at what point in the house system is the 'cusp' of a given house - that is to imagine a point in particular in the house most pertinent to that house. For many it's the beginning of the house/sign but there can be ambiguity there. For many this causes problems, in particular with angles, not least because there is no astronomically obvious sense of pivoting or being a focus of movement that some of the other house systems have with them which many believe is what provides the quality of dynamism for the angles. In addition an astronomical angle, the midheaven, could be found in another house but the 10th which some have issues with - for whole-sign-advocates the extra detail could instead provide greater meaning or nuance, being able to provide extra meaning when the MC is in the 9th for example. There is nothing particularly astronomically relevant about the 10th house angle itself in whole signs. The 10th then becomes more a symbolic relationship of being at 90� angles by sign with the ascendant which is nonetheless an important consideration. Another house system seeks to rectify some of this desire many have for precision. Like whole, equal uses the ecliptic to divide up the sky, but unlike whole, equal recognises the actual degree point of the ascendant is the point of dynamic energy and so takes that exact point and divides up the ecliptic evenly into 12 from that point. That is to say if 28� was at the ascendant, every subsequent 28� of each subsequent sign would mark the beginning of each subsequent house. In this system we now have something somewhat similar to whole sign houses but with a sense of degree aspectual relationships to the ascendant. In other words in whole the beginning of the a house cusp may be close or far from degree based aspect to the ascendant, but for equal it is exact. For example if a planet is at 28� of Capricorn and the ascendant is at 28� Aries. For whole, the 10th house begins at 0� Capricorn, the 11th at 0 Aquarius. For equal it begins at 28� Capricorn. This means that in whole this planet seems closer to the 11th house cusp, whilst nevertheless being in the 10th and making a partile/exact square to the ascendant. But in equal it is exactly on the 10th house cusp - the analogy we can make then between a whole sign aspect vs a degree based aspect is obvious here. However equal has something else going for it, which is to say it has an astronomical basis for the 10th cusp. The 10th house has a sense of being visible or heightened or where we gain recognition or applause or where we in some manner peak or fame. It likely has these qualities because the 10th is, for most house systems, a point at which a given planet gains greater altitude. Well the equal 10th house cusp is synonymous with the nonagesimal - that is to say that any planet on the 10th house cusp (being simplistic about it) will have a higher altitude than any other planet in the chart. IF we think about that a bit and we were to stand outside at night and see Jupiter higher than any other planet in the sky then we might think it normal and obvious to assign to it qualities of visibility and recognition and being at a peak and so on that we associate with the 10th. Whole signs do not have this astronomical basis but instead will, somewhere within that house, contain the nonagesimal. So a planet at the beginning point of the equal 10th has astronomical focus, one at 0 of the whole 10th seems to lack some of that merit or broadens it into the entire sign within a 30� abstraction. Again this may be the difference between whole sign aspects vs degree based aspects. So far we've focused just on one astronomical point, the ascendant and we recognised that in whole the no astronomical point coincides with the beginning of the house but instead is found somewhere in the house and that equal is more degree specific. But both divide from the ascendant point. Equal however can also be imagined to divide the sky into four quadrants - that is to say the quadrant from the ascendant point to the nonagesimal (highest point on the ecliptic), then nonagesimal to the descendant, and then the descendant to the point opposite the nonagesimal and then finally the quadrant back to the ascendant. In practice of course whether we just divide from the ascendant and add 30� or take each 90� segment and divide by 3 we would still get 30� so the arithmetic is the same either way. But it raises an interesting point of view - we have another astronomical position we could divide the ecliptic into four quadrants from - that is the midheaven. Now you may be tempted to think the midheaven is the highest point at which a planet can be - but that is the nonagesimal. To be more specific at any moment in time, the nonagesimal is the point of highest altitude of the ecliptic, but as the earth turns the angle which the ecliptic makes with the horizon appears to change because the ecliptic is at an angle to the motion of the earth's spin. I've included some diagrams on this below so if this doesn't make sense right now hopefully it will make more sense by the end of the post. 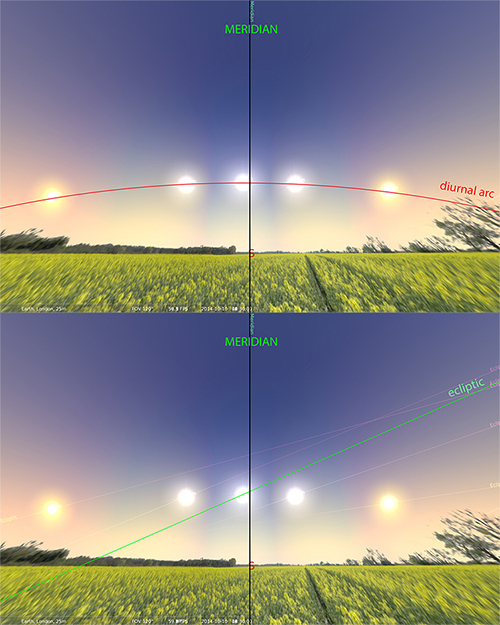 The end result of this is that planets, carried by the earth's spin, appear to go from east to west but before they turn from east to west they obviously have to reach the point directly south (from a northern horizon perspective), so at the point at which it reaches directly south, that is to say intersects with the meridian line to the south, that will planet will obviously have the greatest altitude it can possibly have - it's the culimination or peak of its own individual journey from east to west. That intersection with the meridian is what we call the midheaven. And the nonagesimal and midheaven are not the same point - the nonagesimal is, at any moment in time, the highest point on the ecliptic, but the midheaven (MC) is the highest point in the course of a full day that that point will ever attain. So we can imagine the line of the ecliptic and the angle it makes with the horizon will change over the course of the day and so whilst at this moment Juptier may be on the nonagesimal and so is the highest point on the ecliptic, later on, say an hour or so later, the angle the ecliptic makes with the horizon will change and Jupiter, now at the midheaven, will have an even higher altitude than it did earlier. Of course at that time there could be some other point with an altitude higher than it at the nonagesimal. So both the MC and the nonagesimal, for different reasons, can hold the significance of being at a peak, at highest point, visible, the sense of applause or fame etc. we recognise with 10th house symbolism. So rather than divide between the ascendant alone, we can divide, sort of like equal, between the ascendant and another point. Whereas equal can be imagined to divide between ascendant and nonagesimal, we could also divide between ascendant and midheaven. Porphyry houses do just that - they divide along the ecliptic, like whole and equal did, but this time rather than taking 30� segments along the ecliptic, they instead divide up the quadrants formed between the ascendant-descendant axis, and the MC axis with the point opposite it (the IC). They divide each quadrant into thirds. So taking an example, 28� Aries rises, and 17 Capricorn is at the MC. Well there is a difference of 105� between the ascendant and MC. That is to say if we counted how many degrees of the ecliptic there were between the ascendant and midheaven we'd have 105�. And so this is our first quadrant and we divide it into 3 equal sections => 105/3 = 35�. So each of our houses between the ascendant and MC will have 35� each - houses 12, 11 and 10. The same is done for the other quadrants. Now we can imagine three planets when 28� Aries rises. One at 0 Capricorn which will be right on the beginning of the whole sign 10th house but at which there is not astronomically relevant point. One at 17� Capricorn will be at the MC and at the Porphyry 10th house cusp, and one at 28� Capricorn will be at the nonagesimal which is the equal 10th house cusp. When we divide up a house system, like we have with Porphyry, between the ascendant and the MC-IC axis, we refer to it as a quadrant house division. The other house systems I'll refer to will be quadrant house divisions. It's noteworthy that whole has no other astronomical point to define it other than the ascendant and that equal is the only house system to define it using the nonagesimal as its 10th house cusp. You may notice that an attempt here has been made so far to divide up the sky using some astronomical 'great circle' (i.e a geometrical circle which can be considered to have an indeterminable radius) - in this case so far that has been the ecliptic only. That's very tempting because we already use the zodiac so much and the zodiac is a 12-fold division of the ecliptic and so it can be tempting to divide up the sky using the ecliptic too. Well so much for dividing up the sky using the ecliptic. Because really the fact that planets rise in the east and set in the west, including the path they make in the sky when they do, really has very little to do with the ecliptic. Keep in mind that the ecliptic and celestial equator are not parallel but instead at an angle to one another. If it's not obvious yet, the reason the planets appear to rise and fall is that the earth spins on its axis - which we can imagine like a spoke puncturing the earth through the north pole and out the south pole and then spinning that spoke causing the whole earth to rotate. The centre of the earth which describes that spinning is the equator, so we can imagine it like the earth has a belt on right at the centre. But that circle has infinite numbers of parallel circles and in fact any given planet, regardless of where it is in the sky will likewise trace out a circle and this circle is caused by the exact same spin as the equator and therefore all will be parallel with the equator. 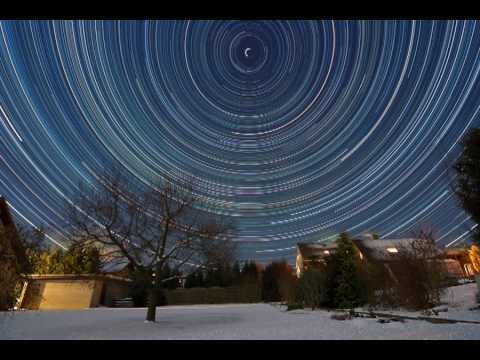 You may have seen time lapse photos of the stars at night and how they seem to make different circles all of which are parallel - that's because like the equator they're all caused by the same spin (the earth spinning on its axis). It's important then to understand that when a planet is rising in the east and appearing to move in an arc to the west (a diurnal arc) it is not parallel to the ecliptic either - that is to say the path along which the planets appear to move in the course of a day is not the same path as the ecliptic which is the path they make in the course of a year. To really make this distinction clear, and the fact that the eclipitc (the path the planet inscribes in a year) is not the same as the arc it appears to make in a given day because of the earth's spin take a look at this image which can be imagined as a snapshot of the sun over the course of a couple of hours with a line drawn between them, in the first image, to show the direction and path the sun is taking (the diurnal arc), and the one below it includes the line of the ecliptic at each of those moments in time as they appear from an observer's position. I've included the meridian line here, so we can infer we're imagining an observer standing facing south. Well if we understand and accept this, perhaps it makes less sense to use the ecliptic as the great circle we're going to use to divide up the sky. Equal and whole and porphyry all use the ecliptic, but clearly we could conceptualise this differently and recognise that if the house systems are about capturing some sense of daily motion and position and that this is not the same nor even in parallel with the eclipitc maybe we should put that to one side and use another circle or some other way to divide up the sky. As we'll see, the ecliptic is really just one way to do it, all the other house systems I'll discuss use another way of dividing up the sky. So we already saw if we stand outside and watch the planets and stars over the course of some time we'd see them rise in the east and set in the west and that this motion they inscribe is not the same nor parallel with the ecliptic. But maybe we should divide up the sky from what we might imagine we can see if we just actually went outside and looked at the sky because clearly we cannot easily imagine the equal/whole/porphyry houses if the ecliptic is making different angles to the horizon through the course of the day. Well we divided up Porphyry from the ascendant and the midheaven, and what we divided up into equal sections between each quadrant was the ecliptic. Well what if we imagined doing it visually? What if we imagined we walked outside, stood facing directly south - that is to say with our back to the north pole and facing directly south. If we did that we'd be aligning ourselves along the meridian and we'd have the ascendant somewhere to the east, which will be to the left, and the descendant somewhere to the west, which will be somewhere on the right. Well we divided up a quadrant as being from ascendant to midheaven, so let's do the same thing, but without the ecliptic. The midheaven is just the intersection of the ecliptic and meridian and the meridian is just a word for a line running north and south and we're aligned on that line. So we could imagine that the entire area of sky to the left of us is the ascendent to midheaven quadrant, and the whole area of sky to the right is the midheaven to descendant quadrant. We can divide each quadrant into three sections again. So in order to imagine this what we could imagine is that we stand facing south and we look to the point on the horizon directly in front of us directly south and we imagine a line going straight up into the air. If the line continued it would go up and up over our head and it would fall behind us directly to the north in a straight line 90� to the horizon - in other words this is the meridian. So there will be 90� to the left/east of that line, and 90� right/west of that line. If we divide up that 90� into 3 30� sections and we likewise projected them through the air until they met with 3 30� counterparts behind you to the north you'd essentially have three segments formed by 3 imaginary lines to the left, and three segments to the right - much like we might imagine the segments of an orange. This is in effect what Campanus houses are. My explanation is a more visual understanding of Campanus houses, but a more definite way of describing it is that we take the prime vertical - the imaginary circle running east and west through the point direclty over head (zenith). 90� of the prime vertical will go from east to the zenith overhead, and 90� will go from the zenith overhead to the west. Campanus houses takes the prime vertical and projects through the north-south pole points on the horizon at 30� sections of the prime vertical. Either way what you'd have is a house system which divides up the sky around you as it actually appears to you and somewhere within each segment will be a given planet, and each of these segments can therefore be a house. We've removed the focus of calculating houses from the ecliptic/zodiac and divided up the sky in a more natural way to an observer of the sky. To summarise the houses describe the position of planets and points in the sky and these planets and points move through every house in the course of a day. As they do so, they move toward the angle (succedent), are at an angle (angular) and move away from an angle (cadent). Whole, equal and porphyry all divide up the same great circle - the ecliptic. Whole signs divide evenly from the beginning of the sign of the ascendant and clearly incorporate one astronomical axis (Asc-Desc). Equal divides similarly from the degree of the ascendant but divides by degree and incorporates two astronomical axes (Asc-Desc, Nonagesimal points). Porphyry divides up two astronomical axes (Asc-Desc, MC-IC) to form quadrants and divides each quadrant by thirds. Campanus is a demonstration of how we need not rely on the dividing up the ecliptic but can divide the entire sky around us into segments and also divides up into quadrants the Asc-Desc and MC-IC axes as do all the other house systems we typically refer as being "quadrant" house systems. It's briefly worth reconsidering our early premise regarding the dynamic sense of motion of coming to an angle and being angular and moving away from the angle. With whole signs there is no clear astronomical angle involved, instead the angle becomes a symbolic rather than astronomical angle. The symbolic angle is the sign 90� from the sign of the ascendant, and so there isn't any astronomical sense of a planet moving from the ascendant point, moving away from the ascendant point and then moving to a point which connotes highest altitude and then moving from that point. All the other house systems mentioned so far have an astronomical point/angle at which the planets can be said to move toward, be at, and move away from which was so intrinsic to our idea of succedent, angular and cardinal. With whole the relationship is less clear or is more abstract and the best case we can make for whole is that, almost by accident, whole will contain the equal 10th house cusp somewhere in its 10th house, in other words it will contain the nonagesimal. But whereas astronomically a planet, say the Sun, at the equal 10th will be exactly on the point of highest altitude, in whole the planet may not yet be at that point, or may already have passed that point. Therefore unlike the other discussed so far, whole is somehow a more abstract symbolic relationship when it comes to angles and the notion of moving to or away from them. Finally the last thing to point out here is that we can define all the house systems entirely differently than I have, and this will become more useful to be aware of for future house systems. We can describe the houses as all being about the division of some great circle, and projecting that circle through a point 3 dimensionally 90� from it. This seems like it sounds very complicated but fortunately we're all very familiar with one such way of dividing up. We're all familiar with lines of longitude and latitude. In the diagram below, we see a circle, in this case the equator, divided up into varying degrees, and then an arc connecting the equator to the poles of the earth. So if we take any circle and mark off points every, say 30�, we could then draw an arc from that circle, three dimensionally, to some point 90� from it, in this case the equator is the circle and the earth's north and south poles are the points we project through. I'll now describe the houses mentioned so far in the same way. For whole, take the zodiac along the ecliptic and project every 30� at the beginning of a zodiac sign through the pole of the ecliptic itself - the poles being the points at 90� three dimensionally from the ecliptic. So if our earth has a pole 90� from the equator, the ecliptic has a pole 90� from the ecliptic. Equal divides up not the zodiac, but takes the ascendant point and every subsequent 30� and projects them through the ecliptic pole, and porphyry takes a third of the arc as said before between each quadrant and projects through through the ecliptic pole. So far the great circle all three of these divide up is the ecliptic, and the point they project through is the pole of the ecliptic. Campanus takes a great circle and divides it through a pole as well, but not the ecliptic or the ecliptic pole. Campanus uses the prime vertical (great circle running east-west through the point directly overhead, the zenith) and divides each quadrant into thirds and projects those divisions. But this time the pole it projects through is the pole of the prime vertical. That pole is the point directly north on the horizon and directly south on the horizon. So another way then of describing the calculation or computation of a house is to talk of a great circle which is projected through a pole. If we apply this way of thinking to all the houses we no longer imagine the houses as being just different ways of finding where planets are on the ecliptic but instead we can start to imagine the entire sky around us as being divided up with the houses as being like lines of longitude stretched through the sky. We could point so some airplane and or a bird flying and imagine it's part of a house system - we never do this in astrology of course but the point is that we're dividing up the sky, and not just artificially calculating some planet to see where it plots to. We should start to have a sense of the houses being part of the sky. If we imagine campanus again for just a moment, campanus is perhaps the easiest to imagine as being the easiest to visualise as being a division of the sky around us. All we need to do is know where south is. We roughly visualise the other houses above the horizon. Say we wanted to find the 12th house, we could just imagine we stand facing south and then hold our left arm out at 90� from our body so it points off out to east somewhere toward the horizon. Well if we then imagine we raise our left arm by about a third we would be roughly pointing at the 12th house cusp. If we imagine an arc running from a point on the distant horizon directly south as we're facing it, through where we are pointing to and back the a point direclty opposite it, we've marked out the 12th house cusp. And If we can see Jupiter and we realise it's contained in that little segment of the sky, we can say it's in the 12th house cusp. Notice that we don't need to find or plot the ecliptic/zodiac itself. Also notice that it doesn't matter what time of the day it is you do this. You may not be able to see the planets in the day time, but you can still know where the cusp is. In fact we can imagine that these house cusp lines are always there and that instead the planets just basically move through them. It's not so much that we calculate where the houses are at a given time, the houses can be imagined as staying the same throughout all of time, but we need to calculate is the position of the planets to see which house they happen to fall in now. And when we think of houses themselves as having some kind of structure or solidity and in which people stay, we could if we wanted, start to understand something of the astrological houses as being permanent things in the sky through which planets stay and move on. In fact, tellingly, our very earliest systematic description of houses, found in Manilius, exactly describes them something like this - that they are fixed or static in the sky itself, and it's the planets and the zodiac signs themselves which move through them. Obviously this is somewhat problematic for whole sign houses as in this instance the houses are not static but defined by the zodiac - and so the zodiac signs do not move through the houses as much as define them - but for the other house systems to greater or lesser degree, this kind of symbolism holds true - at the very least we see that the planets and the zodiac itself are passing through the houses and being carried from angle to angle. Hopefully we'll have built up a picture of houses not necessarily needing to be imagined as being part of the ecliptic, but instead part of the whole sky and about the passage of time of planets which carries them from angle to angle and recognise that the ecliptic, along which all planets move, is at an angle to the direction of motion of the earth's spin which moves all the planets in a given day through the houses. This motion can be represented visually by the equator - within a day, a point on the (celestial) equator will trace out a full circle on the celestial sphere, or rather will trace out the celestial equator itself. So far we've been focusing mostly on the ecliptic and show with Campanus a different way of doing things. But if the earth itself, and its spin, is responsible for carrying the planets through the houses in the course of a day, we could imagine a house system which actually uses some sense that the earth rotates to define it. Well if the equator is the circle that gets defined by the earth's spin, we could divide up this into 12 equal sections. We've mentioned a lot about the meridian line, which is the great arc/circle which runs from the poles of the earth through the point over head. Well obviously this line, if runs from north to south pole, will intersect the equator, and will do so at 90� angles to the equator. So this meridian line connects an observer to the equator, by plotting a line of longitude through our location - in fact this meridian line, when it intersects the eclipitic, is the MC, the beginning of the 10th house in systems like Campanus and Porphyry and all the other quadrant house systems. So the meridian line is used to create the 10th house and it connects us to the equator which is the circle we can use to describe the rotation of the earth itself. What if we, from where the meridian intersects the equator, divide up the rest of the equator into equal 30 degree sections, and then we could divide them through the north and south pole as well? If we did this, we'd have the meridian house system. it is a clear attempt to relate a given point on earth back to the earth's spin which is responsible for carrying planets through the houses to begin with. However, notice that the calculation is only from the meridian line - we could say it's only from the 10th house cusp. The first house, then, is 90� not along the ecliptic (like with equal or, more abstractly, with whole), but instead along the equator. So this point, the east point, and the arc emanating through the poles from it, is the 1st house cusp. But crucially in this system the first house will not coincide with the ascendant - that is because the first house in the meridian house system is coinciding exactly directly east, and the ascendant is the intersection of the ecliptic and horizon to the east, but the ecliptic moves north or south of east through the day. So they do not align. Additionally imagine our globe from before, if we're only calculating the house system from a line of longitude, which is what the meridian is, then it really doesn't matter what latitude we are, say, born at. Anyone at a given longitude would have the same houses and the zodiac would pass through it. But this lack of connection back to the ascendant is problematic for many astrologers and this house system remains not popular outside a small subset of astrologers. Uranian astrologers prefer this system and advocate its use, and also to connect us back to the very principle of earthly rotation that the houses rely upon, but for many, that lack of a first house coinciding with the acendant is a problem. To continue my discussion of projecting a point on a great circle through a pole, Meridian projects 30� segments along the equator, from the meridian line, through the earth's poles, that is, the poles of the equator. Like Meridian houses, Regiomontanus is a division of the equator and likewise can be imagined as starting from the same principles as the meridian house system - that of connecting us back to the principle of earthly rotation which causes the planets to appear to move east and west through the sky over the course of a day. However, so far when we've described houses in terms of projection of a point on a great circle through a pole, we've always used the pole of that same great circle. Whole, equal and porphyry are divisions of the ecliptic through the pole of the ecliptic, and campanus is the prime vertical through the pole of the prime vertical, and meridian is the equator through the pole of the equator. But because meridian is not connecting back to the horizon in its calculation, it divorces the first house from the ascendant - which is on the horizon by its nature. A very simple change to the Meridian calculation can change this - rather than project the equator through the pole of the equator, we an project it through a point on the horizon. In Campanus houses we projected through the pole of the prime vertical, which is the meridian connecting the horizon in the north and south. Regiomontanus uses this meridian, like meridian houses do, to connect to the equator - but crucially, unlike meridian houses, Regiomontanus projects the equator through the poles of the prime vertical itself, so it projects it through a point on the horizon bringing this sense of earthly rotation into a more immediate setting that is unique to our location and not true of the entire longitude like with meridian. The side effect, or perhaps intention, that this will bring is that now we're projecting through horizon, the intersection of the first house will be at the horizon - just like where the ascendant is. In other words, Regiomontanus houses will have something like the meridian philosophy in mind, connecting back to the earth's spin, but will retain the first house as being at the ascendant. If Meridian houses solves a problem of needing to connect to the earth's spin, but creates a problem in that the ascendant is no longer relevant to our local horizon, and that the ascendant is therefore not the coinciding with the first house, Regiomontanus can be imagined as building on Meridian but solving those problems raised. So before continuing, we've now discussed 6 different houses. We have three ecliptic based divisions (whole, equal, porphyry) and they all project through the ecliptic pole, and then we have a more apparent-spatial division of the prime vertical (campanus) through the pole of the prime vertical, and then we have two divisions of the equator (meridian and regiomontanus), one of which is through the pole of the equator (meridian) and one through the pole of the prime vertical (regiomontanus). It may start to suddenly become apparent that we can take any given great circle (say, horizon, prime vertical, equator, ecliptic etc.) and project it through the pole of its own great circle, or indeed the pole of another great circle, if we think, for any reason, that this would be meaningful. This gives us a couple of dozen possible combinations right off the top of my head. Yet, whilst we can do this, the reality is that we typically don't. You may think, well the ecliptic is really important, we know that, and we've just discussed how important the equator is to bring back that dynamic sense of movement, so why not project the equator through the ecliptic. We absolutely could, and that's the "Morinus" method, so called because Morin de Villefranche described it, but, as far as I know, he described almost more in theoretical terms - I don't know if he actually used it himself. Of course we know from our problems with the Meridian method that this will mean we lose connection of the first house with the ascendant, and so we return to all the problems we might have there. At this point we might start to realise, as if we didn't already, that the whole subject of house division is principally one about trying to relate complex patterns of movement or division of the sky and that actually the more we look into them all the more we can imagine that they all have astronomical merit in some way or another. Some of those forms may not have as much symbolic merit to us, and others may seem to be more compelling or have greater symbolic meaning or merit. Perhaps because of this, are house systems and debates between them so divisive - there are so many ways of cutting up the sky and all of them are sound. A problem, in my opinion, can arise when people are not aware of how all the other systems operate or why they do what they do or what problems they solve in doing it that way - when we only really understand one system, that one system seems very compelling. In reality of course most people choose one system because their teachers used it, or because they just stuck with whatever default system a computer program provides them etc. or they feel there is some appeal to authority or ancientness in their system. For now, the one thing to draw attention as we see with the Morinus method is that we can have all sorts of theoretical house systems which divide any given circle and project through any given point, so really what we might want to keep our focus on instead, is something which seems more meaningful to an astrologer. In this way we might argue that Regiomontanus may well be more meaningful, for many, than either Meridian or Morinus, because all three connect the sky to the apparent movement of that sky caused in fact by the earth's rotation, but only Regiomontanus brings that connection right back to location of a given birth/event/etc. such that the Ascendant comes back to being so intrinsic to the first house like we have with the other house systems. Of course whether you really find that more meaningful or not is an individual concern. I'm going to move away now from describing all the houses as being divisions of a given circle and projection through a given point because hopefully the case has been made that we can do this to any circle and point, but what's really telling or important is the symbolic relationship or understanding we have from that rather than a computation exercise of what we could do. So before continuing with a few last houses (and if you made it this far, good for you, at this point I'm probably just posting to and for myself), it's worth getting as far away from all the complication of the theoretical notions of projecting this or that circle through this or that pole. Astrology should be meaningful so the houses should have some meaningful connection or correspondence for us. When we started to look at equatorially derived houses like Meridian, Regiomontanus and Morinus we were focusing here because the equator is symbolic of the earth's rotation in a day. And this daily rotation is what causes the phenomenon of the planets appearing to move through the houses and that all important notion of moving to and from angles. This motion, primary motion, completes a full cycle every day. Just like it takes the Sun a full year to complete its cycle through the zodiac, it takes Sun a day to complete its cycle through the 12 houses. Astrology is all about time and really we could imagine astrology as being about time telling - not providing a mechanical notation for the current time on the clock, but rather telling the timbre or flavour or uniqueness of each moment. Sometimes this is obvious to everyone, and sometimes not. There is a distinct quality of time at night which is different to day time. Noon has its own flavour and it's different from dawn or dusk. We understand time chiefly on a day to day level without paying much attention to it by considering the Sun and its motion, primary motion, through the course of the day - the same way in which houses are derived. The sun will rise at the ascendant at dawn and at high noon it will reach the MC, then some hours later it will reach the descendent at dusk. Surely we should be able to find a model of the sky which takes into account this all important quality of time? We can, but we have some difficulties we have to understand first. The most important amongst them is that the earth can be understood to spin at a constant rate in a given day - it doesn't speed up at lunch time, slow down during the night etc. It's constant. And we can also imagine that the angle at which the earth spins will therefore increase at a steady rate from 0� at some starting time, to 360� exactly one day later - and because the equator describes this very same spin, we might start to wonder about seeing the equator as telling time. So when we think back to Regiomontanus and the other equatorially defined houses. Are these really divisions of the equator? Which would be a spatially defined division. Or are they of the day itself, which would imply a time based division? Or in fact are they both - is space and time, in this context, actually synonymous? If there is 360� of the equator for every single day, then, say, half a day will be half the circle - 180�. When we calculated our houses along the equator we took each subsequent 30� segments from the MC - 12 of them to make the 12 houses and 360� of the equatorial circle. So if we took 1/12 of the equator, then in fact what we've really done is take 1/12th of a day - that is to say 2 hours (24 hours in a day). In fact we could imagine our Regiomontanus house cusps again with twelve arcs, like longitude, connecting the equator to the poles. Each of these arcs (or circles if we connect them in a circle) represents every two hours of clock time. In fact, in astronomy, such circles are actually called 'hour circles' and there are 24 of them in every day. So each house cusp in Regiomontanus not only represents the earth's spin in some crucial way, but also can connect to a sense of daily time with each house cusp on the equator being a symbol of two hours of time passing. Space and time start to become synonymous with one another in astrological settings here. Suddenly Regiomontanus doesn't seem to be only about dividing up some great circle and projecting it through some pole - that's just mechanical - the astrology and meaningfulness may be in realising that these house cusps are likewise symbols of time through the day. However, one thing I want to highlight here is that it's tempting to think that if 0� Gemini is on the MC right now, and if we realise that the Regiomontanus cusps are each of them 2 hours apart and the earth spins at an even rate, that therefore in two hours time 0� Cancer will be on the MC, or even that if the 10th house cusp is 0� Gemini now, that the 11th house cusp would be 0� Cancer. However, that cannot be the case because once again we have a problem whereby the zodiac signs are not positioned along the equator (were they, this wouldn't be an issue), but along some other circle, the ecliptic, which isn't parallel to the equator but tilted at an angle. What that means is that whilst the earth is spinning at a uniform rate, it appears like the zodiac signs are not rising at a uniform rate - some are taking much longer than others. Nevertheless what we've seen so far of the houses is that whilst they can be computed as being like any great circle through any pole, the reality is that we typically use or are drawn to a house system not because we can calculate it in this or that way, but because there is some meaningfulness to calculating it in that way or in conceptualising the heavens in that manner. Whereas Whole sign houses lack a strong sense of astronomical reference point, equal and porphyry pick that up with the nonagesimal and MC respectively. Whole becomes more symbolically important to many more so because of the understanding people likely have with its history or they fundamentally believe the houses are meant to be compared or connected to the zodiac. Campanus has an obvious connection to a sense of the visible or the apparent and of placing the observer at the centre of his/her universe and conceptualising the sky around him/her. Morinus and Meridian and Regiomontanus all connect to not just spatial descriptions of the equator and of the earth's spin, but bring us right back to the fundamental concept of time itself in some way, whether by accident or design, but Morinus and Meridian houses lose us when it comes to bring us back to the immediacy of our local frame of reference - something which Regiomontanus improves upon and for which the tone can be set to understand the houses in general as being not just factors of space (dividing up 2D circles and projecting them), but of time itself - where space and time are merely two sides of the very same coin to begin with.